Dental or periodontal disease is one of the most common diseases affecting our companion animals, affecting 70-80% of cats and dogs by the time they are 3 years old. Dental disease can lead to bad breath, painful mouth, difficulty eating, lethargy, and can complicate kidney and heart disease. We recommend brushing your dog or cat’s teeth to help slow down the development of plaque. Unfortunately, some pets will not allow their owners to brush their teeth. In either case, routine dental cleaning is essential to maintaining healthy teeth and gums for cats and dogs. A routine dental cleaning requires that the pet be put under anesthesia to allow proper evaluation, cleaning, polishing, and fluoride treatment of the teeth. While your pet is under anesthesia, they will be continuously monitored on a cutting edge multi-parameter machine. This tracks heart and respiratory rates, end-tidal CO2, oxygen saturation, blood pressure, and temperature. They are also closely watched by the doctor and one of our highly trained staff members. We encourage (and if your pet is 7 or older we require) pre-anesthetic blood screening. This allows us to be aware of potential problems and plan accordingly. An individual anesthetic protocol is tailored for your pet by our doctor; this enables us to provide adequate pain relief and the smoothest recovery possible. During a routine cleaning each of your pet’s teeth is individually probed and charted for problems like gingivitis, tartar, mobility and other pathology. We strongly recommend full mouth digital radiographs on every dental procedure to determine the sub-gingival health of the teeth. Since 70% of each tooth exists below the gum line, this allows the doctors to formulate a treatment plan for a diseased tooth. Some teeth that look perfectly healthy on the surface, are hiding problems at the root and need to be extracted, while vice-versa a tooth that looks unhealthy or diseased on top, might still have a solid root base - and can therefore be saved. We now offer the benefits of a laser therapy to help your pet's mouth be the healthiest it can be. One of our trained staff members can perform a treatment after your pet's dental procedure. Therapy Lasers help to reduce inflammation caused by gingivitis, and can help reduce pain after extractions and speed the healing process. Used as a monthly maintenance treatment, it can slow or even reverse painful gingivitis, and help to slow the formation of calculus/tartar. The doctors at Anchor Animal Hospital have experience in dentistry and oral surgery and several have received advanced dental training at the Animal Dental Training Center. This allows the doctors at Anchor Animal Hospital the ability to perform advanced dental care. We are use a surgical approach to remove infected, broken, or otherwise bad teeth to decrease post=operative pain and decrease healing time. Anchor Animal Hospital is also equipped with a state of the art digital dental x-ray unit. Digital dental x-rays produce extremely high-quality images in under 5 seconds! This allows the doctors to easily take x-rays to look for problems under the gums. These x-rays help us resolve difficult cases such as painfully retained or abscessed tooth roots. 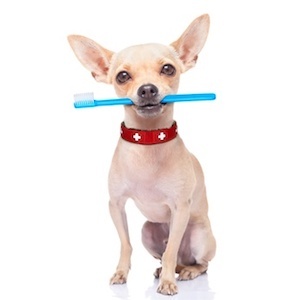 Home dental care between cleanings may include daily brushing with pet toothpaste and dental rinses, tartar control diet (Hill’s T/D Prescription Diet, or Healthy Advantage), and CET dental chews. The doctor and staff at Anchor Animal Hospital will work with you and your pet to find a dental home care plan that fits your lifestyle. We examine our patient’s mouth and teeth as part of our routine yearly exams. This is a good time to discuss dental disease with your veterinarian and determine if any dental procedures are necessary.